-no attempt has been made to anchor any of the raceways. I'm sure this guy (it's always a guy...women know better) does something else well, and should stick with it before he kills himself or his family. That looks like exterior house siding. I don't think this install will be any good for outdoor weather. Knocking a big gaping hole in the siding is also a bad move; rain water can get inside the house and cause rot and such. Unless this is a listed box, he has modified the back by cutting it out. Notice the screws that secure the box to what may be another box behind it. Has anyone seen a listed 1900 with this type of cutout? This IS a listed box. It's used as an extension box on top of a rework (or gem) box. ...listed for interior use only, of course. - While not clear in the pic, the 'ring' is NOT attached to a box behind it; it is attached directly to the building. 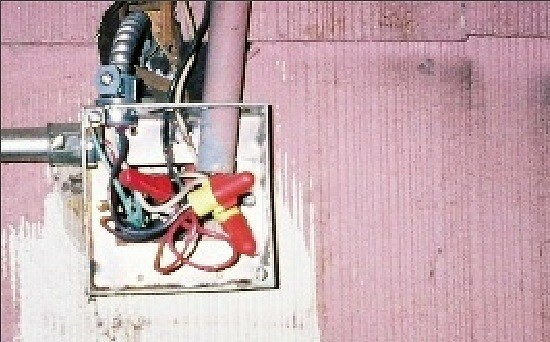 While there is other raceway on the other side of the wall, it does not directly connect to this ring. I am truly amazed as to how many violations can be put in such a small area.